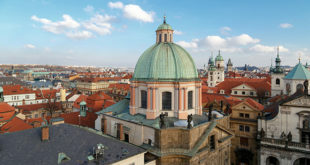 Old Town Bridge Tower (Staromestska mostecka vez) is a masterpiece of Gothic architecture with excellent interior viewing room. Inside the tower is an exhibition of old musical instruments from the National Museum collections but main interest is the 138-step climb to the roof, for amazing views across the river. 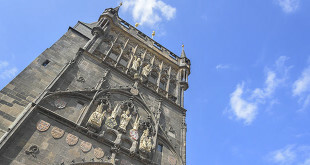 Exterior is decorated with three sculptures – figure of St Vitus, King Charles and Wenceslas IV. During repair work on the tower’s roof, two mysterious signs were discovered. The text of these signs forms a palindrome (without spaces between the words) and is thought to be a spell for strength and power.